Consider the situation illustrated in Figure 14.2 in which, at , a tight-fitting piston is suddenly pushed into a stationary gas, contained in a uniform tube, at the steady speed , generating a shock front that propagates away from the piston, and into the gas, at the speed . Suppose that the piston is located at at , and moves in the -direction. The gas can be divided into two regions. In region , which lies to the right of the shock wave (i.e., ), the gas remains undisturbed. Hence, its velocity is . Let its pressure, density, and temperature be , , and , respectively. In region , which lies between the piston and the shock wave (i.e., ), the gas is co-moving with the piston, so its velocity is . Let its pressure, density, and temperature, be , , and , respectively. Thus, the system is formally the same as that discussed in the final paragraph of the previous section, provided that we make the identifications and . 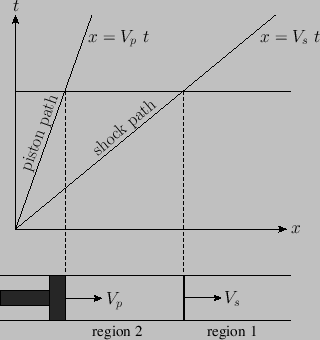 Figure 14.2: A piston-generated shock wave. Thus, a weak shock is associated with a subsonic piston (i.e., ), whereas a strong shock is associated with a supersonic piston (i.e., ).